The genus Sphecodina has 1 species in the USA, and 2 around the world. 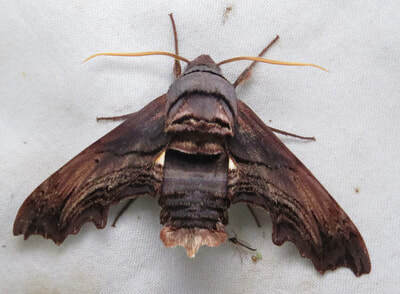 General Information: These are medium sized moths with a yellow hindwing. The forewings are dark. Two species exist, Sphecodina abbottii which has deeply serrated wings, and Sphecodina caudata which lacks the serration and has fairly regular wings.